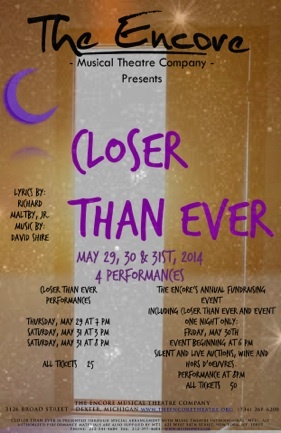 “Closer than Ever” is quite simply, the kind of thing that that Encore Musical Theatre Company does best — small scale musicals with a small, excellent cast, creating good musical theater. This production is no different — four performers on a bare stage with a piano and stools that comprise the set and lay the framework for a series of songs presented in revue/staged concert format. Some of the music was written directly for the production by Richard Maltby Jr, and David Shire, other songs are culled from other shows they have written, or cut from them (for example, the song “Patterns” was cut from their modest hit “Baby” somewhere halfway through the run). Together, they tell a story about relationships, being in couples, not being in couples, divorce, death, love, regrets and hopes. Steve DeBruyne, Mahalia Greenway, Tobin Hissong, and Katherine Kujala create lovely music together, in pairs, in solos, in trios, and every imaginable combination. They also have good stage chemistry with each other. The show breezes by in two short halves, and it makes for a great date night: bring your husband, wife, boyfriend, girlfriend, or combination…or enjoy the show by yourself. It hits every mood just right and has that rare combination of revue: it entertains while keeping you thinking as well. The show is part of the Encore’s annual weekend fundraiser event — Friday night includes silent and live auctions, wine, and hors d’oeuvres starting at 6:00…but there are also two more performances on Saturday at 3:00 and 8:00 pm. But make haste — this production only has 4 performances, and opening night has already come and gone. You can get your tickets at theencoretheatre.org, or at 734-268-6200 — but get them — you’ll enjoy this breezy production, and so will whomever you bring with you. It’s a great introduction for an Encore newbie to what makes Encore special…and repeat visitors will find it to rank among its stronger productions.